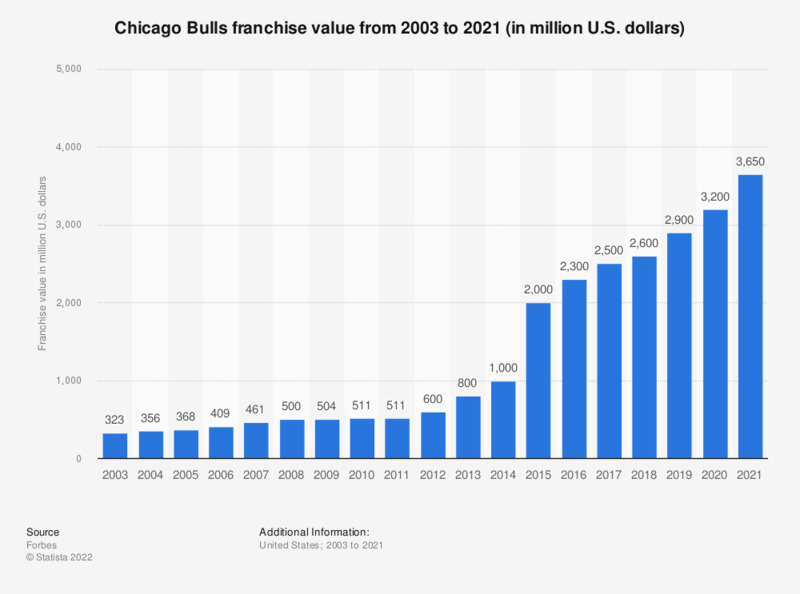 This graph depicts the value of the Chicago Bulls franchise of the National Basketball Association from 2003 to 2019. In 2019, the Chicago Bulls franchise had an estimated value of 2.9 billion U.S. dollars. The Chicago Bulls are a professional basketball team from Chicago, Illinois, that plays in the National Basketball Association. The team joined the league in 1966 and currently plays its home games at the United Center, which has a capacity of about 20 to 23 thousand for basketball games. The Chicago Bulls have won a total of six NBA titles with Michael Jordan, whom many consider to be the best player ever, as its best player. These teams, which were coached by Phil Jackson and also featured Hall of Famer Scottie Pippen, threepeated twice, winning the NBA title from 1991 to 1993 and 1996 to 1998. Forbes ascribes the Chicago Bulls a franchise value of one billion U.S. dollars in 2014, an increase of 25 percent compared to the previous year when Forbes valued the franchise at 800 million U.S. dollars. In the 2012/13 season, the revenue of the Chicago Bulls was at 195 million U.S. dollars. The home games of the team were attended by an average crowd of 21,876 people. Tickets to the games cost an average of 77.65 U.S. dollars in the 2012/13 season, the first time the average ticket price was at more than 75 U.S. dollars. The Chicago Bulls were ranked fourth on the Fan Cost Index of Team Marketing Report with 456.6 U.S. dollars. The Fan Cost Index includes the cost for four average-price tickets, two small draft beers, four small soft drinks, four regular-size hot dogs, two game programs, two adult-size adjustable caps and parking for an hour. Everything On "Chicago Bulls" in One Document: Edited and Divided into Handy Chapters. Including Detailed References.